END PAIN, REGAIN RANGE OF MOTION AND PREVENT RE-INJURY Millions of people suffer from debilitating shoulder problems every year. 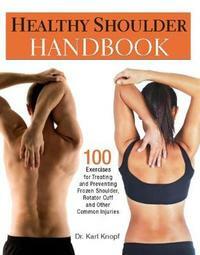 With Healthy Shoulder Handbook, you can take yourself off that list. This friendly manual outlines the causes for common shoulder conditions, including shoulder impingement, rotator cuff, tendinitis, dislocation and repetitive motion injuries. Illustrated with over 300 step-by-step photographs, Healthy Shoulder Handbook offers easy-to-follow exercises to: * Build strength * Improve flexibility * Speed up recovery * Prevent injury Healthy Shoulder Handbook also features specially designed programs to reverse or alleviate the strain from high-risk sports and occupations, including construction work, desk jobs, tennis, golf and more. Follow the approach in this book and you'll be able to quickly get back to the job (or back on the court!) and stay there--pain free! Karl Knopf is the coordinator for the fitness therapist program at Foothill College of California.